Submarine networks are traditionally designed with reliability in mind, and great efforts are devoted to this key parameter of the life of a system. However, submerged systems are only qualified for approximately a 25-year lifetime, placing major strains on a network, particularly as a demand for additional capacity grows in a specific region or between end-points. Aqua Comms DAC (“Aqua Comms”), for example, has announced plans for continued investment in its submarine cable network, having joined the HAVFRUE consortium, which will own and operate a new cable system connecting New Jersey to Denmark and Ireland. HAVRFUE is the first new subsea cable in the North Atlantic to connect Northern Europe to the U.S. in about two decades. The cable will also provide connectivity to Norway. Aqua Comms will be the system operator and landing party for the U.S., Ireland and Denmark. TE SubCom will be the supplier for the system for which route survey operations have already started. The HAVRFUE subsea cable has a projected Ready-for-Service (RFS) date of 4Q 2019. Aqua Comms will offer capacity services and raw spectrum on its part of the HAVFRUE cable network under the America Europe Connect-2 (AEC-2) brand name, as complementary to its current underlying transatlantic cable, America Europe Connect-1 (AEC-1), which connects New York and Killala, Ireland, located in County Mayo. What’s more, Aqua Comms is now finishing a brand new cable route to Denmark that runs through the U.K., is developing CeltixConnect-2, connecting Manchester to Dublin, and is working on a North Sea Connect cable that will link Stellium’s Newcastle, England data center to Esbjerg, Denmark. 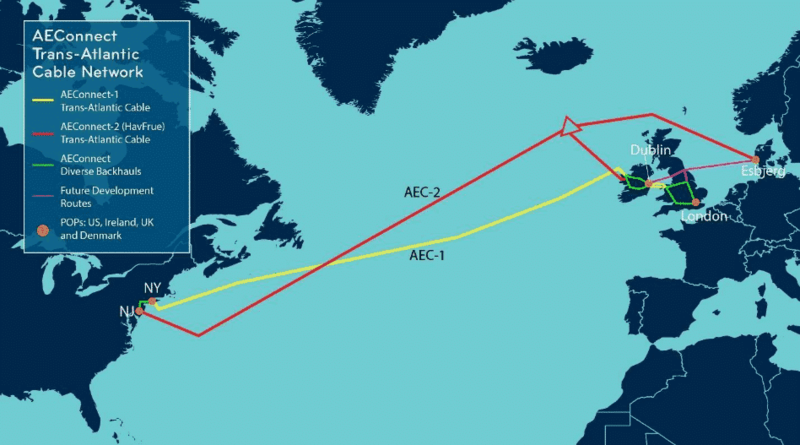 By combining the HAVFRUE / AEC-2 cable system with existing systems owned and operated by Aqua Comms, the company is establishing a resilient, ring-based infrastructure that will connect the East Coast of the U.S., Northern Europe and Ireland. It will connect the hubs of the pan-Atlantic hyperscale data center industry in Ireland, North America and Scandinavia. HAVFRUE / AEC-2 infrastructure network services will be delivered from and to modern, high-reliability, carrier-neutral interconnection points at 1025Connect in Long Island, New York and NJFX in Wall, New Jersey. It will also offer an important Manhattan bypass route, which will increase resiliency and diversity in the region. In Europe, services will be offered from all carrier-neutral, metro area Points of Presence (PoPs) and landing stations and in London, Dublin, Esbjerg and Amsterdam. Plus, the system will more than double fiber connectivity to Denmark, drastically improving the region’s Internet connectivity. Aqua Comms will be attending PTC’18, January 21-24, in Honolulu, Hawaii; Metro Connect, January 29-31, in Miami, Florida; and Submarine Networks Europe, February 20-21, in London. Aqua Comms would like to invite organizations to meet with representatives at all of these events so that it can help improve long-term connectivity needs for companies across the Atlantic Ocean. For more information about Aqua Comms, click here.